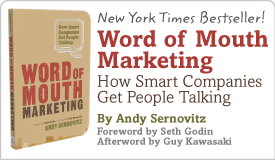 I accidentally watched this whole 42-minute presentation | Andy Sernovitz | Damn, I Wish I'd Thought of That! Our whole office stopped when we saw that sentence — “I accidentally watched this whole 42-minute presentation” — in an email. It wasn’t meant to be a big deal. But it was a great demonstration of the power of a fantastic email subject line.